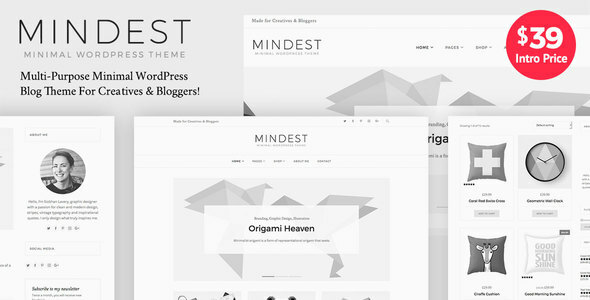 Mindest is a powerful minimal blog & creative WordPress theme. It’s suitable for many personal website such as fashion, photography, portfolio, travel, lifestyle, food, elegant magazine, beauty, nature, architecture, DIY, mommy, craft, shopping, writter, blogger, minimalist designer, artisan & artist, agency, handmade, jewelry, jewellery and general corporate minimalistic website. Mindest – grayscale WordPress Theme comes with Unyson framework. We have been developed our theme, collected every feedbacks from previous customers and put everything into this theme. The theme is super flexible with tons of great features. Mindest is also featured with Revolution Slider & Essential Grid, the most powerful slider and Instagram grid plugins on the market. Save $51 Plugins Value – included with Revolution Slider $25 and Essential Grid $26! Cross-browser compatibility: FireFox, Safari, Chrome. Customer Support part is important thing for us. We try our best to serve customers & make sure they are happy with our theme. Please submit ticket to http://lpdthemes.ticksy.com/ and our support team will help you with the issue related to our theme. NB! – Images license in preview demo is not included in theme package!